Give your audience all the information they want and need in a high-tech way with an interactive system. An interactive experience is a benefit to any business. Our solutions are completely customizable from the hardware to the content. This can open thousands of opportunities and can be tailored to your unique needs and goals. Empire Digital Signs specializes in interactive digital signage design, so let us help when it comes to touchscreen functionality. All of our products are supported by a professional in-house content creation and management team. Our graphic designers work directly with your creative team to develop the perfect combination of hardware and design for your business. Need a little inspiration? Check out the interactive kiosk section of our blog and discover demos and informational videos on our YouTube channel. Wall Mounted: Mounted on the wall such as traditional digital signage displays. The perfect solution for high-traffic areas, as it takes up no floor space. Custom wood or metal frames can be added to wall mounted displays to match the décor of its surroundings if desired. Pedestal Mounted: A custom made pulpit is crafted much like a new piece of furniture, which is typically mounted at a 45 degree angle. Pedestal mounts are perfect for venues looking to be ADA compliant or would like to encourage children to use the interactive kiosk as well. Pedestals can be created with metal or aluminum for a sleek modern look or of custom stained wood for a traditional look. Kiosks: The most popular interactive kiosk enclosure. The upright, free standing enclosure encourages use and can also be designed to be ADA compliant. Great for mobility if you think you might want to change the location every now and then. Kiosk enclosures come in a variety of finishes and can even be vinyl wrapped with a custom design. The user interface is heart of the system, driving the user experience. Our software experts can design an interactive experience that is compelling, feature-rich, and easy to navigate. Adjustments to your user interface and even full redesigns can be made at anytime- nothing is permanent when it comes to UI design! 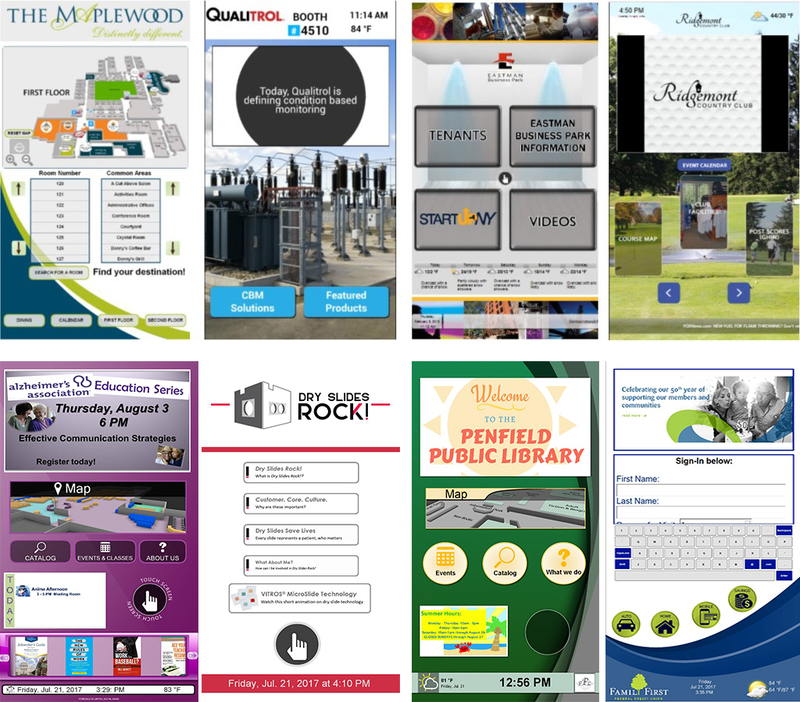 Empire Digital Signs will work with you to ensure that your content is always fresh and relevant for your users. Navigating a large facility is always a challenge even when appropriate signage is utilized. 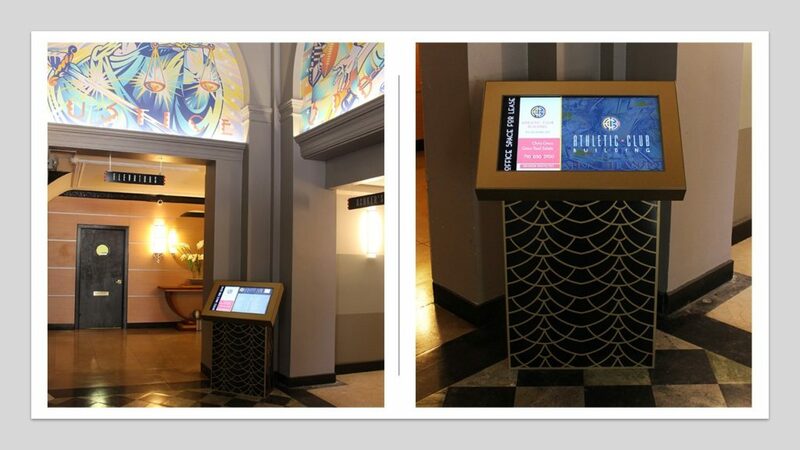 Adding a wayfinding feature to an interactive kiosk is an effective way to ensure that guests find their location quickly and easily. 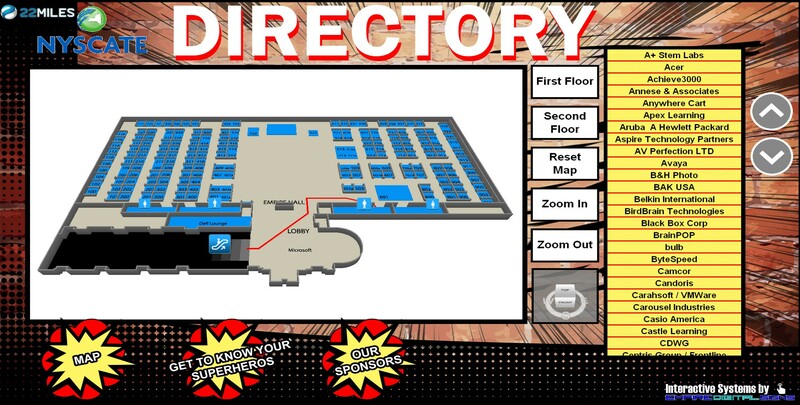 Watch the video below and visit our wayfinding page to learn how beneficial this addition can be to your interactive kiosk. Empire Digital Signs can develop a content package that is exclusively tailored to your business, incorporating product and service information, as well as external content such as news and weather. All of our products go through an extensive in-house testing process. Once your system is up and running, we provide on-going support services that monitor your displays, ensuring smooth operations with minimal down-time.